Happy first day of Spring! 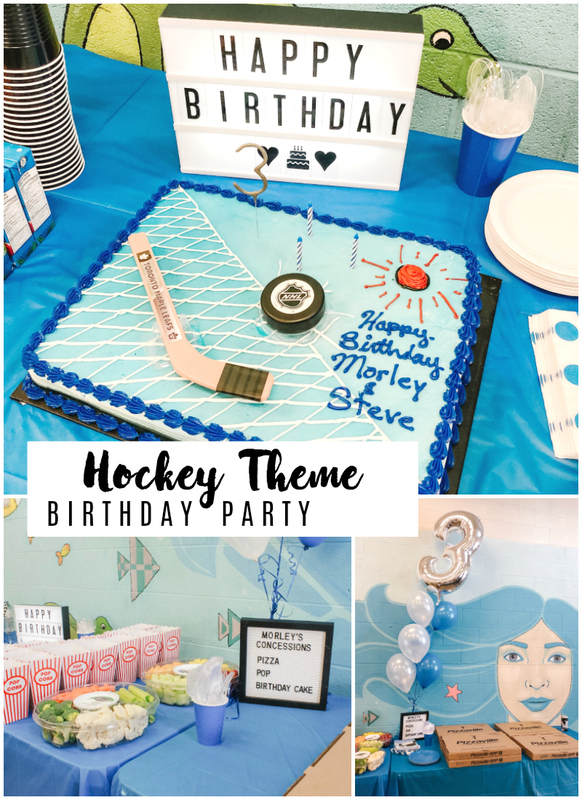 Let’s talk a step back in winter (for just a few minutes) and check out the hockey themed birthday party we recently threw for our newly 3 year old daughter. 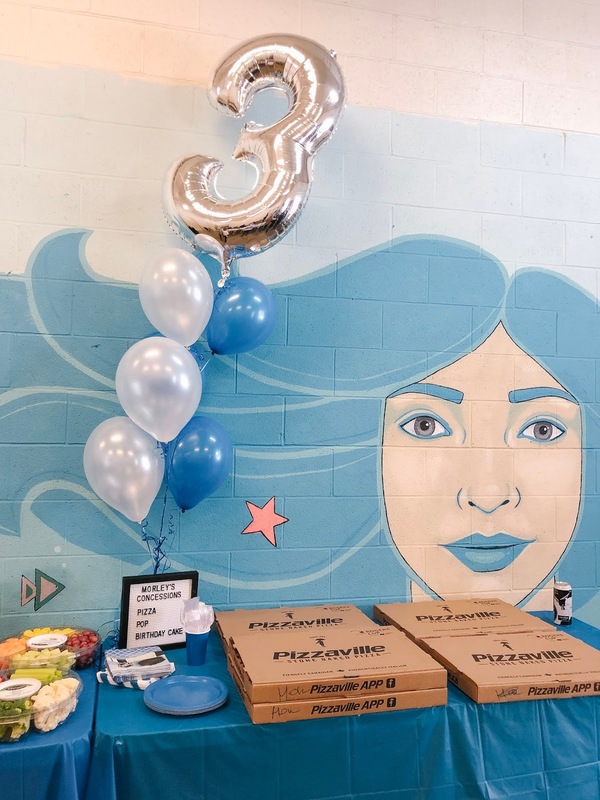 Earlier this month, we celebrated our oldest’s 3rd birthday. Seriously, THREE YEARS OLD. Where does the time go? 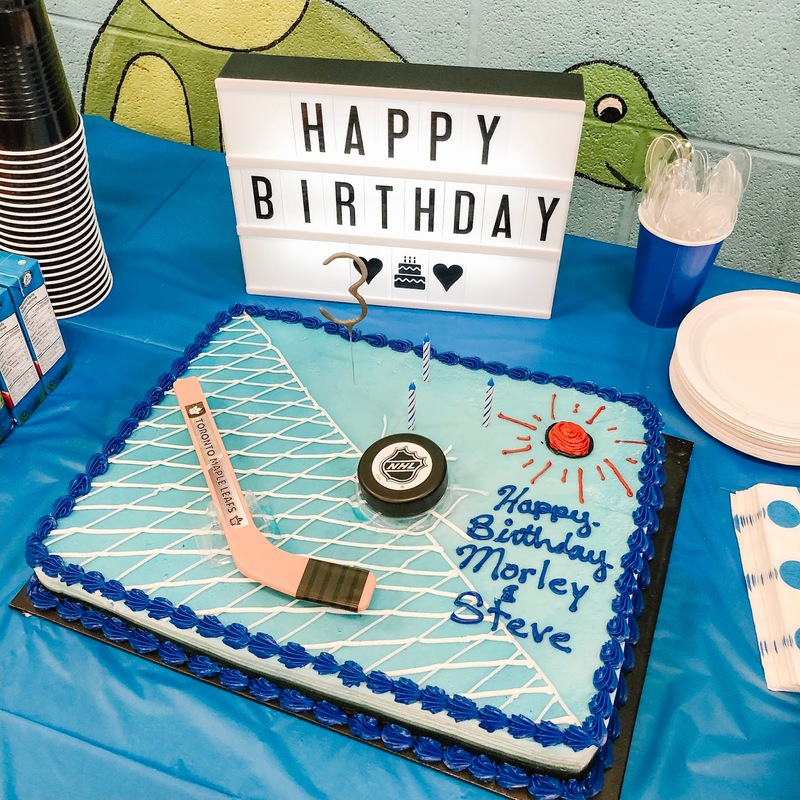 When we asked what she wanted to do, the answer was simple - she wanted a hockey themed birthday. A skating party. 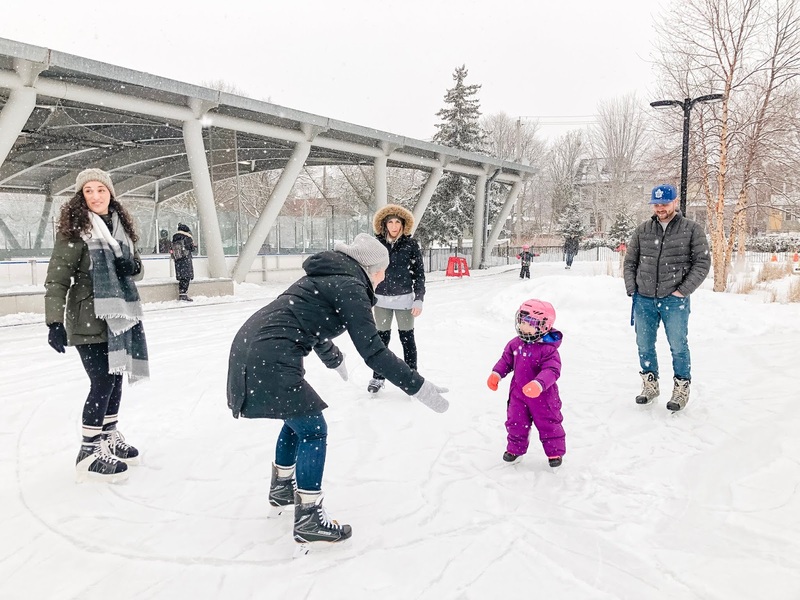 No surprise there, considering how much time we’ve spent “hockeying like daddy” (aka skating) at our favourite outdoor skating rink the past few months. So, it was settled. 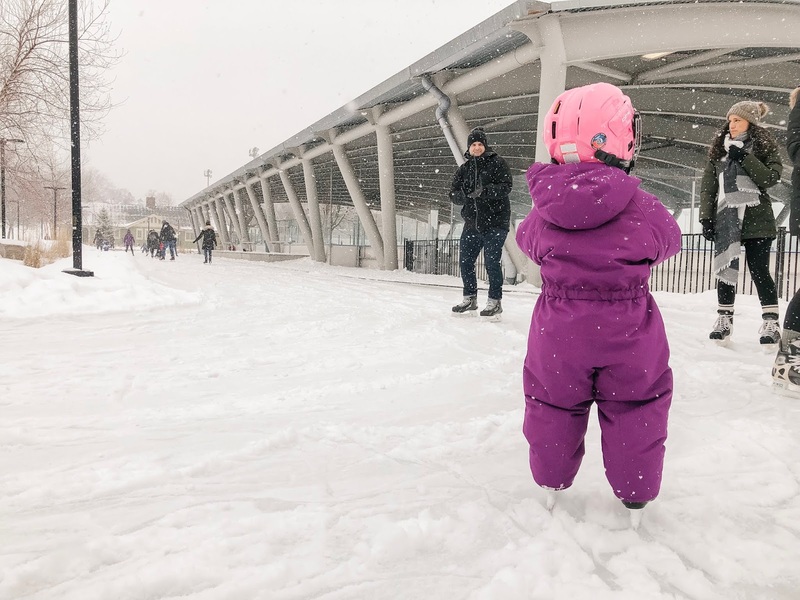 A hockey-themed birthday party at the City of Toronto’s Greenwood Park it would be. You can read all about her first birthday here and second birthday here and here. 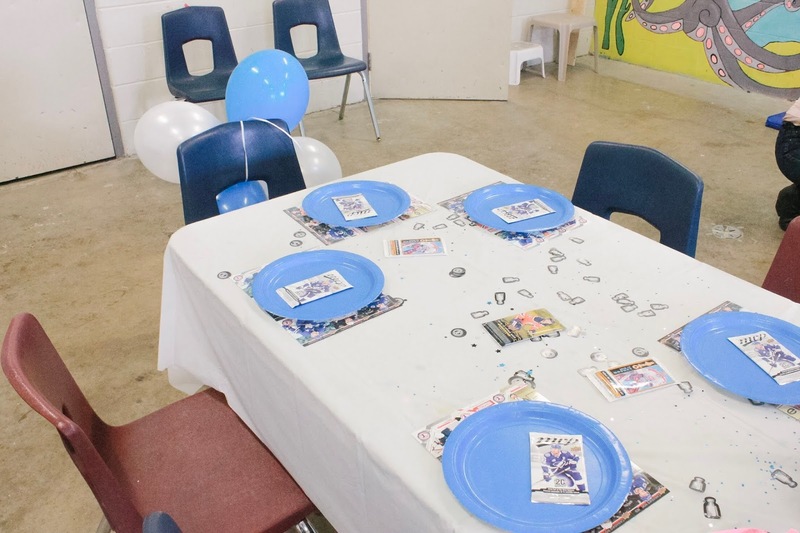 What is a hockey themed birthday without hockey themed birthday party decorations and favours? The community room that we rented from the City wasn't anything special, so it needed a little sprucing up. After scouring Pinterest for a little inspiration, we started at the local dollar stores (Dollar Tree and Dollarama here in Ontario). They didn’t have a ton of hockey-specific decor, so I had to think a little out of the box. For the colours, I chose blue and white (with a bit of silver) for our home team, Toronto Maple Leafs. Table cloths were also blue and white. We added some packs of hockey trading cards to the table, for both the kids and the adults. I found hockey-specific plate, napkins and table confetti at Party City Canada. This is also where I purchased the large helium balloon arrangement, with silver “3” and white and blue balloons. My favourite Dollarama find was the letter boards (which came in three different colours). At only $4 a pop, they were a great steal and I will be able to use them again int he future for the blog. 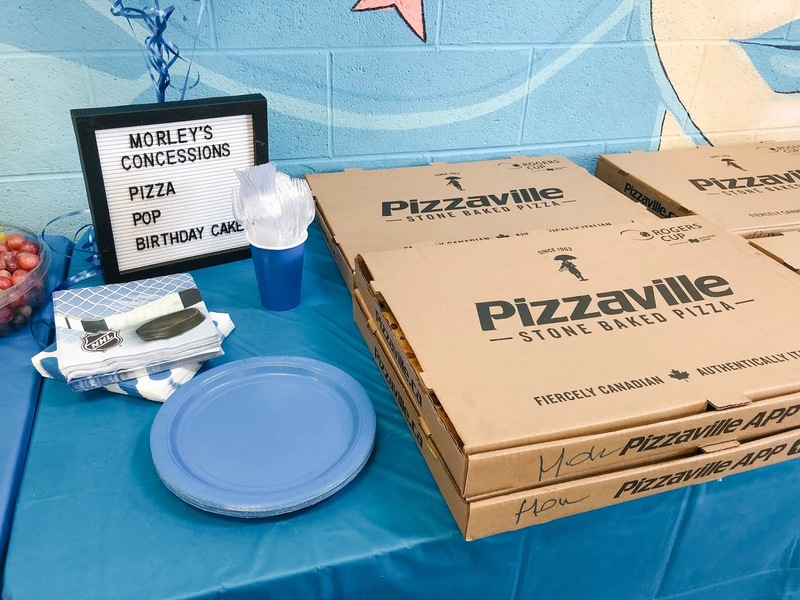 In terms of food, we ordered pizza from Pizzaville, and also had pop, juice, chips, veggies and fruit. 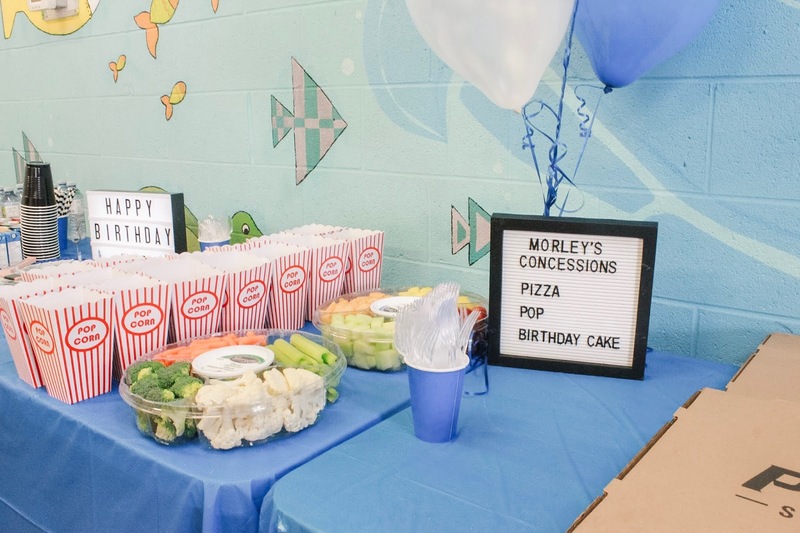 The boxes for popcorn and chips were also from Dollarama, they reminded me of a concessions stand which was the look I was going for. For the candy bar, I purchased candy at the Bulk Barn. I found black and white striped bags at Dollarama, and they reminded me of referees. The hockey-themed cake was ordered from Loblaws. 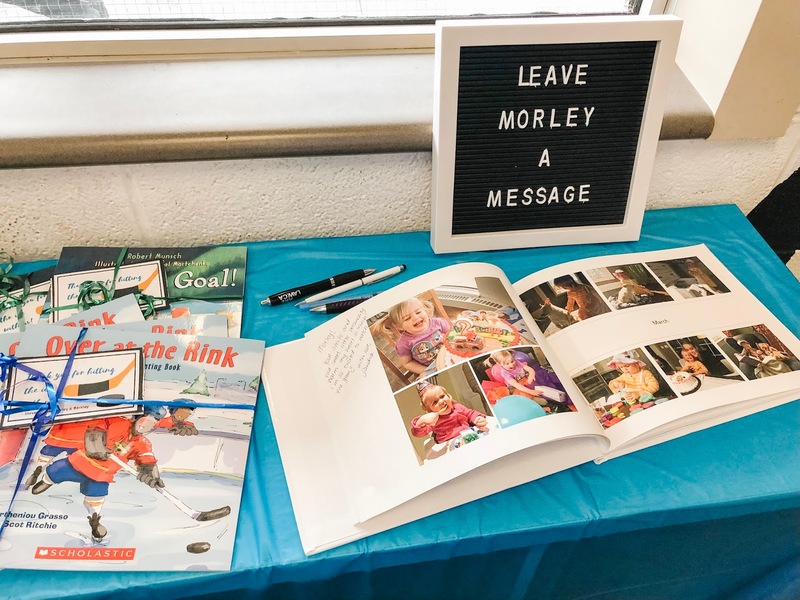 A tradition we started for Morley’s first birthday was a photo book, ordered through Shutterfly. We compile all of our favourite photos from the year and organize them by month. We then get everyone at the party to write a fun message for her. I always have fun building them, and its a great keepsake for her to look back on when she’s older. 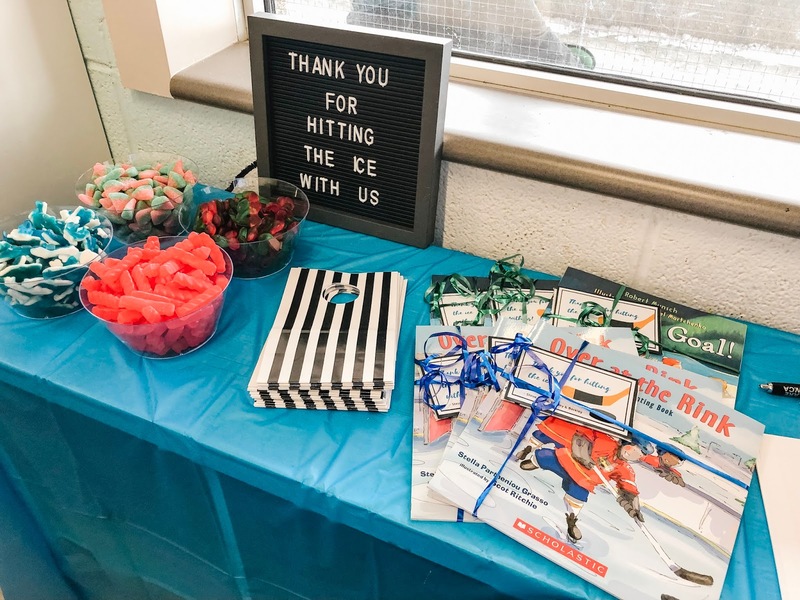 Instead of a traditional goodie bag, we gave each of the kids that came a hockey-related story book, specifically Over at the Rink: A Hockey Counting Book (by Stella Partheniou Grasso) and Just One Goal! (by Robert Munsch). Ok, so I was pretty proud of myself for the theme and decor. But all Morley cared about was the skating and the people. And that was fine with me. 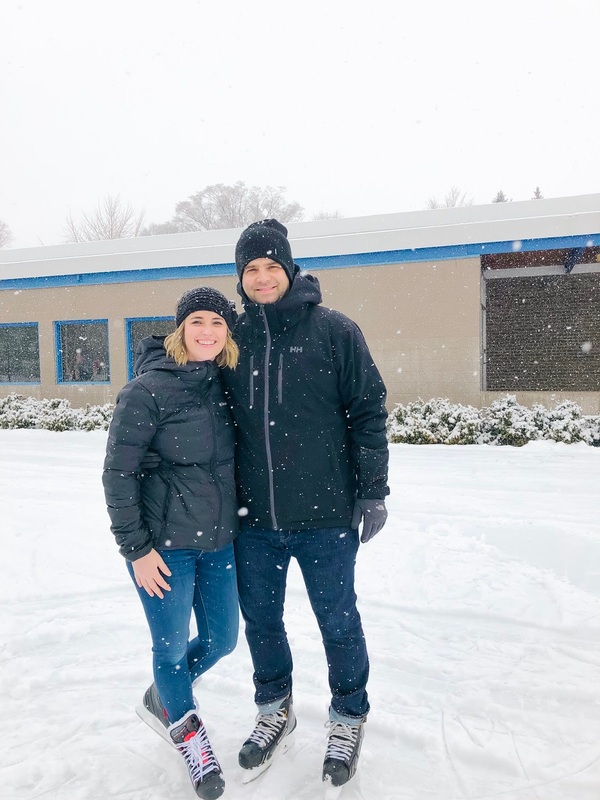 The day was absolutely perfect, even with the massive amount of snow falling from the sky. We really couldn't have asked for a better day and better celebration. 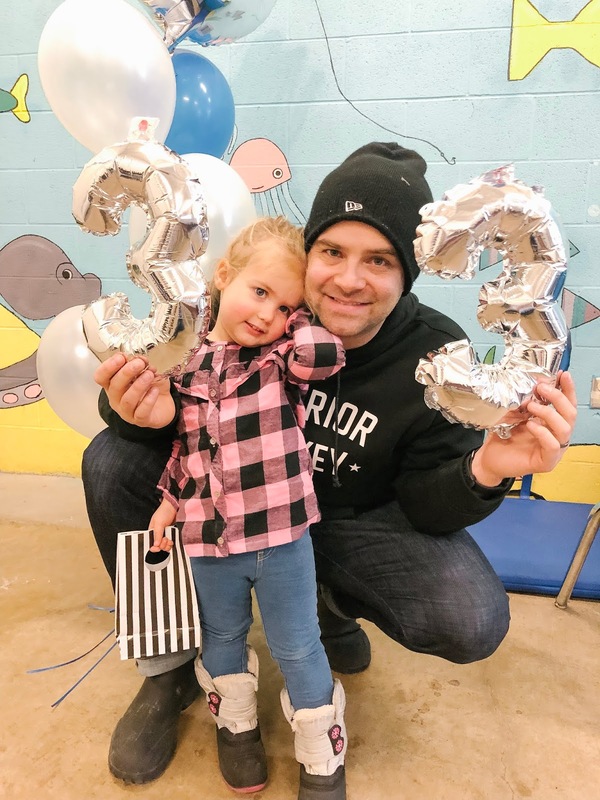 She had such a great time celebrating #3, and seeing a smile on her face made me one happy mama. You know how I know she had fun? She has asked me every day since to “go back to her skating party”. So if anyone has any suggestions on how to creatively tell a toddler that she won’t have another birthday party until next year, please send them my way. 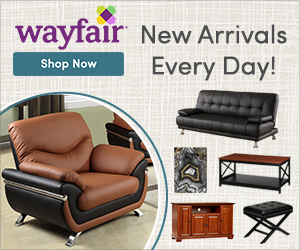 How do you celebrate your kids’ birthdays? Any favourite themes you’ve done? I’d love to hear!